High winds tore through a home in Lark Harbour on Friday, ripping off the roof and leaving the building in shambles. 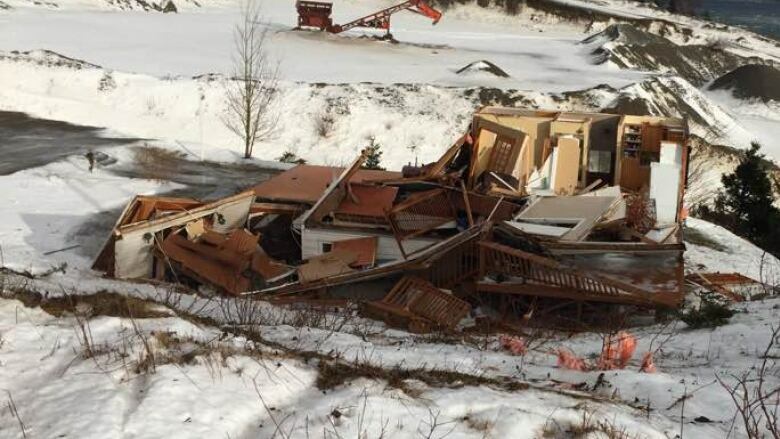 High winds tore through a home in Lark Harbour, Nfld. on Friday, ripping off the roof and leaving the building in shambles. 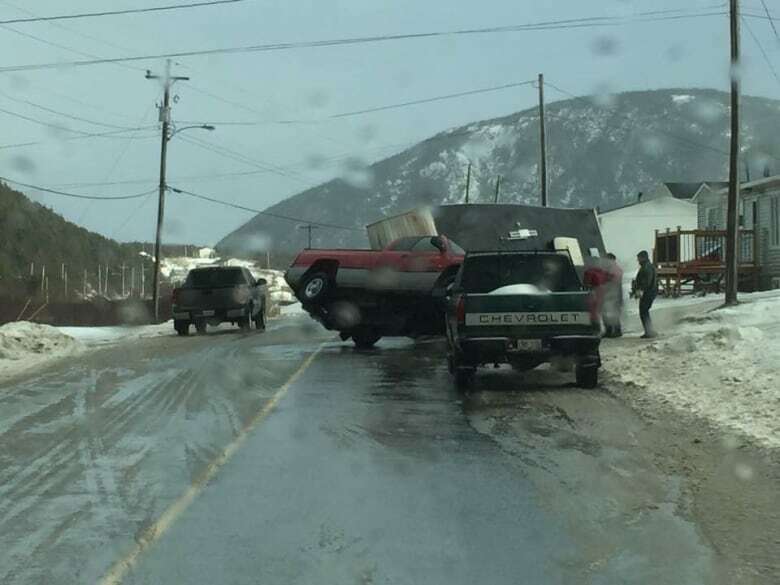 The RCMP said Friday night the community was experiencing "hurricane force winds," and warned residents to stay inside. "High winds are blowing large pieces of debris through the air," the RCMP wrote in a news release at about 8:30 p.m. Friday. "[We ask] people not travel to the area as it's proving unsafe to do so." Several other houses were damaged, power lines were down, and tractor trailers were blown across roadways. Lark Harbour resident Michael Childs said the home was destroyed but nobody was injured. He wasn't sure if anybody was inside at the time. He said conditions on Friday were astounding. "I'm almost 50 years old, and it's probably the worst I've seen here. Like I've seen lots of wind, but this one here has done a lot of damage." 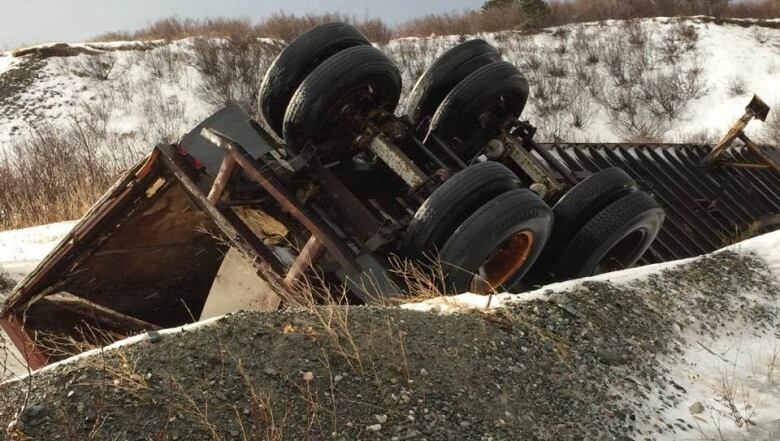 Lark Harbour was not the only site of casualties from Friday's severe weather, which saw high winds and surging seas in several areas around Newfoundland. A fishing boat that was featured in Discovery Canada's Cold Water Cowboys reality series was heavily damaged during severe weather in Port Saunders, on Newfoundland's west coast. Conway Caines's fishing vessel, called Sea Doo, was washed into the beach after high tides and heavy winds caused it to break away from a wharf Friday afternoon. Caines said his fishing boat was not the only thing damaged in Port Saunders. He said many wharves in the town washed away, seawater washed over the town's low road, and a convenience store was damaged. 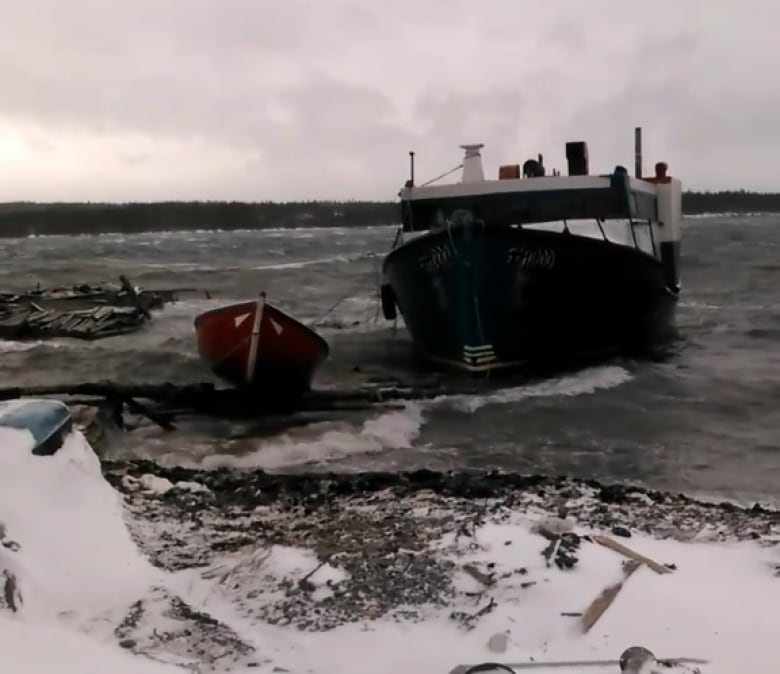 "To get enough sea to come from the bottom of Port Saunders to wash away wharves and tear boats clear of wharves, I tell you it's the worst I've ever seen," Caines told CBC News on Friday night. Caines said the wind gusts topped 150 kilometres an hour in the town, and waves were about a metre high. Despite his best efforts to reinforce it, his 45-foot boat broke clear of several ropes. One rope held but the seas and wind still managed to drive the vessel onto a nearby beach. He said the Sea Doo was still a good boat. It was his father's vessel, originally built in 1974. The younger Caines had since moved on to a bigger boat so he could fish turbot. He was planning to refit his father's boat for tours, but now says he has no choice but to tear it down on the beach where it lies and rebuild it again. "There's no way to get it back out of it. Unless we get another big, big, high, high tide." "She's in far enough now where the sea had washed her on in, shoved her on in, that it's just [a] mess for me," he said. "I guess I'm going to be the rest of the winter trying to clean it up." There was severe weather up and down central and western parts of Newfoundland on Friday. Caines says the sea washed over wharves and grounded boats in Port Saunders, and "everybody was running mad" to pull vessels further ashore. Peak gusts of 176 km/h were recorded in the Wreckhouse area of the southwest coast, according to Environment Canada meteorologist Rodney Barney. And a storm surge of 70 centimetres was recorded in nearby Port Aux Basques. 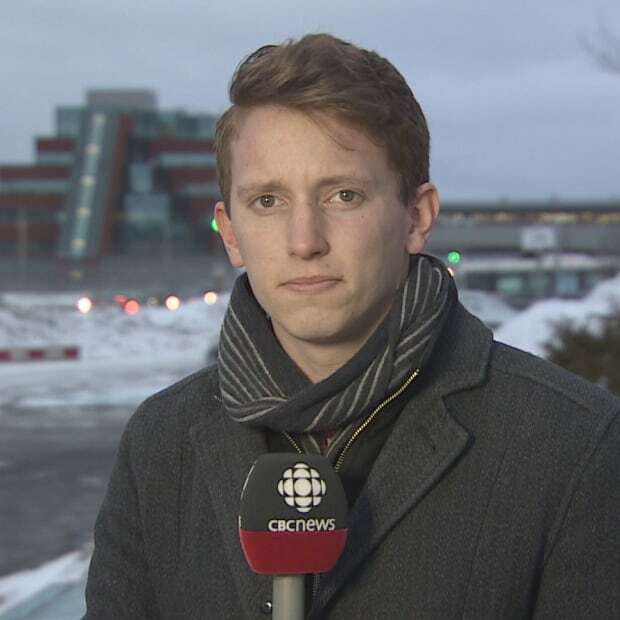 "We had a fairly intense low-pressure system track up through the Gulf of St. Lawrence today," Barney says. "With that, we saw some very strong winds and some heavy rain moving over most of the island." He said the peak gusts in the Wreckhouse were probably in the top ten of recorded wind speeds in the past couple of years. More than 30 millimetres of rain fell on the south coast of the island. In Cox's Cove near Corner Brook, Gregory Crane captured videos of high tides as well. He said there wasn't much visible damage there as of Friday evening. Barney said wind speeds have already begun dropping in some parts of Newfoundland, and the system should move through overnight.